Hurricane Matthew is making its way through the Caribbean towards the eastern seaboard of the United States less than 60 days before the end of the 2016 Atlantic Hurricane Season. As we continue to track Hurricane Matthew in the possible advent of U.S. landfall, several local authorities have been activated in Florida and other U.S. coastal states. As local, state, and federal authorities release updated information throughout the course of this week, it is important to understand the impact of this storm and how it may affect public safety and property risk management. 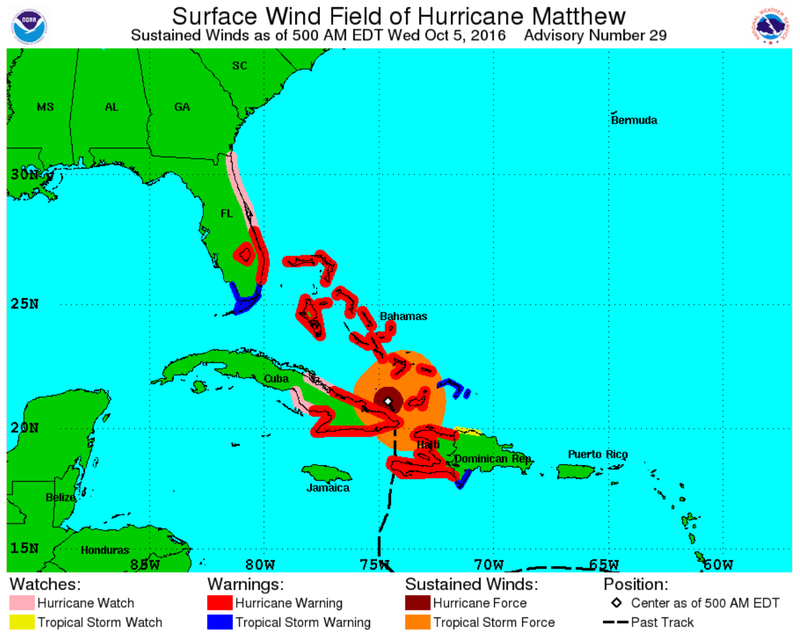 Even if Hurricane Matthew does not make landfall, the wind projections are sufficiently elevated to anticipate severe property damage in the outlying portions of the storm. As illustrated in the graphic below, as of 5 am this morning, Advisory No. 29 reports that the entire eastern coast of Florida is under a tropical storm and hurricane warning/watch. According to the National Hurricane Center (NHC) and National Oceanic and Atmospheric Administration (NOAA), the above graphic shows an approximate representation of coastal areas under a hurricane warning (red), hurricane watch (pink), tropical storm warning (blue), and tropical storm watch (yellow). The white dot indicates the current position of the center of the tropical cyclone, and the dashed line shows the history of its center. Understanding the difference between National Weather Service watches and warnings is critical to being prepared for Hurricane Matthew or other any dangerous weather hazard. The National Weather Service issued “watch” lets you know that weather conditions are favorable for a hazard to occur. A “warning” designation means a weather hazard is imminent - it is either occurring or it is about to occur at any moment. Additionally, the issuance of an “extreme wind warning” indicates that sustained winds of a major hurricane (115 mph or greater), usually associated with the eyewall, are expected to begin within an hour in the designated area. While there is no substitute for the professional analysis of engineering and climatological experts with regard to the effects of storm force winds, a general understanding of the Saffir-Simpson Hurricane Wind Scale is helpful in comprehending the implications of a warning designation in the context of anticipating the potential for devastation. The Saffir-Simpson Hurricane Wind Scale (a 1 to 5 rating based on a hurricane's sustained wind speed) estimates potential property damage. Hurricanes reaching Category 3 and higher are considered major hurricanes because of their potential for significant loss of life and damage. Category 1 and 2 storms are still dangerous, however, and require preventative measures. An animated illustration of the various scales of damage is available for observation here. 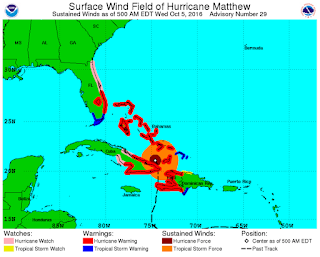 As Hurricane Matthew heads toward the Bahamas and makes its projected westward turn toward the Florida coastline, its strength should be monitored and preparations undertaken to handle the insurance claims arising from the probable trail of destruction that it is expected to leave behind.